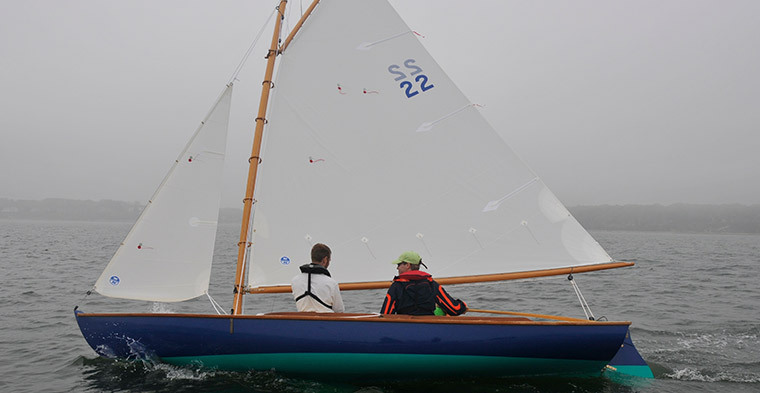 The original Baybirds were designed by Starling Burgess for the Corinthian Yacht Club sailing program in or around 1916 and built by William Chamberlain in his shop on Orne Street in Marblehead. The first fleet moved south to Duxbury Yacht Club and then on to Chatham Yacht Club where they remained as a racing fleet until newer classes took over. Over thirty boats ended up at various sailing camps on Pleasant Bay most notably Quanset, Pleasant Bay, Viking and Avalon camps. 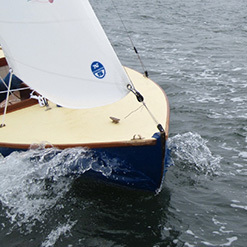 Over the years, the wood hulls were glassed over which extended their sailing careers. Of the original fleet, only two have survived. 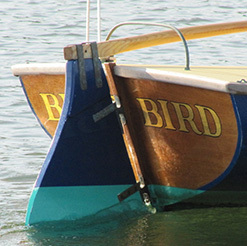 In the mid nineties, Merv Hammatt made a mold from one of the old boats, and began production of 20 fiberglass Baybirds. When we took over in 2005, the mold was tired and due for retirement. The fleet has rebounded with older boats racing out of Namequoit Sailing Association on Pleasant Bay. It still continues to grow even now with some of the older boats being restored by camp alumni and their families. Their condition varies depending on the origin of the hull and the budget of the owner. Some have questionable rigs. They are all different, except for the sheer excitement of sailing them. Alumni from the sailing camps that once flourished on Pleasant Bay are getting wind of this resurgence and stopping by the shop or visiting us at boat shows. Their stories are full of fond memories of sailing and racing Baybirds on the bay. It's these stories that convince us that this is a boat worth investing in. The class is officially registered as the Baybird Class Association, which will oversee all design parameters and class rules. 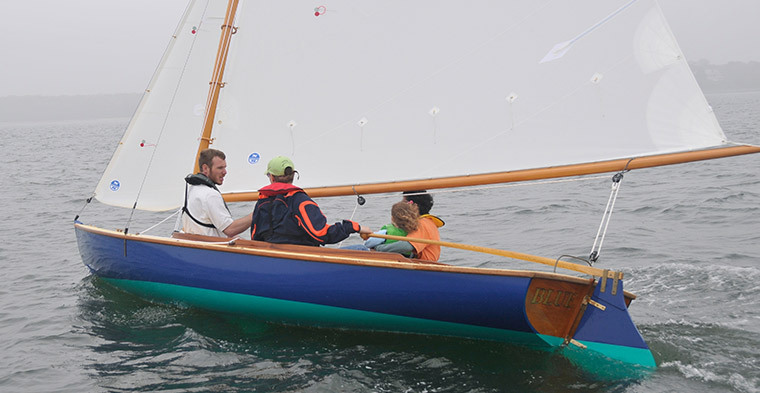 Pleasant Bay Boat and Spar Company is the recognized sole builder of the official Baybird. In the time that has passed since we became involved with Baybirds, our focus has shifted from fiberglass construction back to a more modern interpretation of a wooden boat. It has been our plan to modify the way we build our production boats so that the environmental impact is reduced as much as possible. The Baybird is a unique classic knockabout design that we felt would appeal to a certain type of sailor. With that in mind, we feel confident that building it in a wood composite construction would allow us to adhere to our carbon footprint goal and at the same time introduce sailors to an altogether different sailing experience. 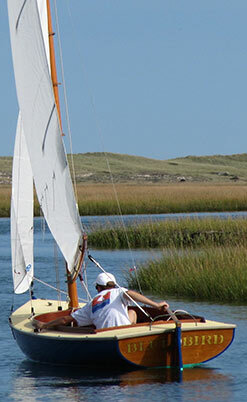 In the fall of 2008 we took the lines off the last remaining wooden Baybird still sailing on Pleasant Bay. Pura Vida, owned by Andrea Lobkowicz of Orleans, is now approaching 90 years old and still actively participates in weekly races. The outside of the hull had been sheathed in fiberglass, which certainly helped to preserve this hull. We had replaced a dozen ribs, keelson and centerboard trunk in hopes of regaining the original shape. The hull profile and body plan was drawn by Suzanne Leahy, and then the offsets were sent to Steve Hollister at Newave Systems for fairing. 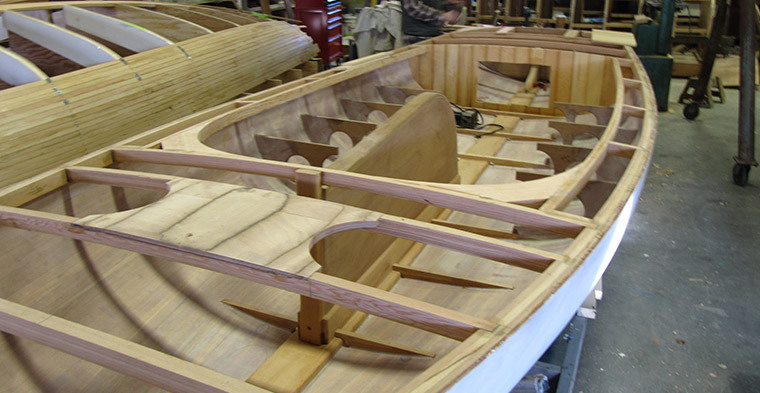 In January 2010, the molds were set in place and building was begun in earnest on the first new wooden Baybird to be built since 1920. In June 2010 Starling was launched. 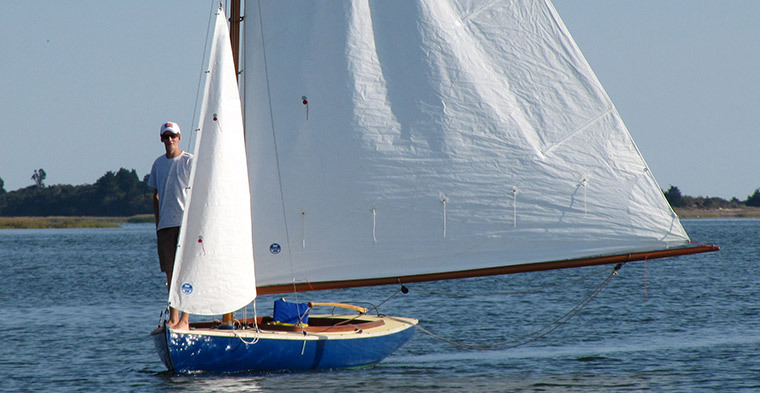 She made her debut at the 2010 Wooden Boat Show in Mystic CT where she won the prestigious Concourse d’Elegance Honorable Mention for Professionally Built Boat. 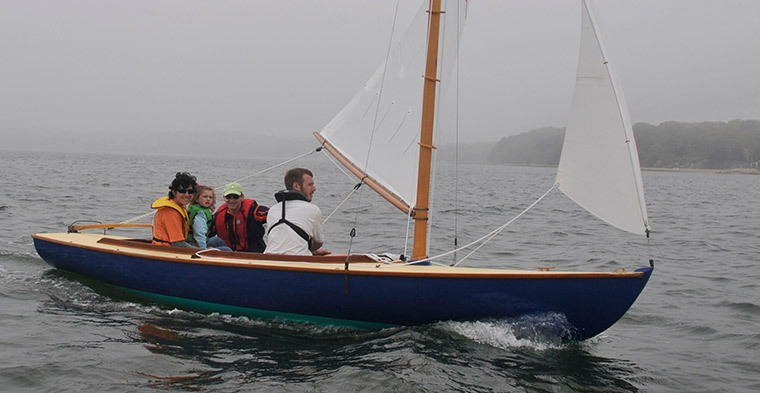 In December Starling was featured in Wooden Boat Publication’s 2010 Small Boat Journal. 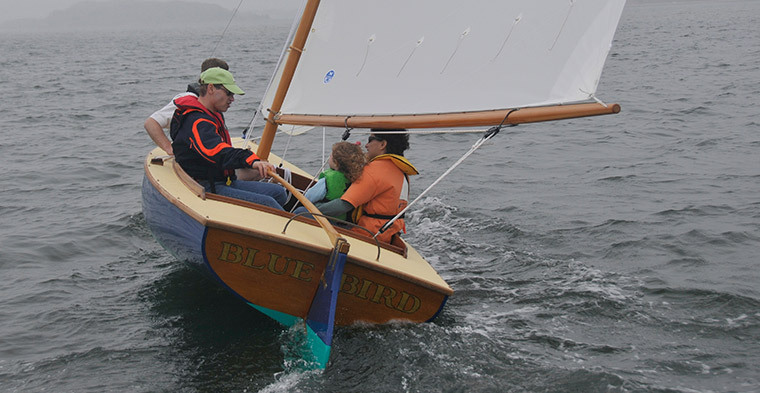 Starling has been exhibited at the Maine Boat Builders Show, the Wooden Boat Show, and the Cape Cod Boat Builders Show and has influenced the sale of our second cold molded Baybird, Bluebird, owned by the Roth family and sailed out of Brewster. Starling will attract many more fans as she sails her home waters and beyond, campaigning for what is truly a classic sailing experience.